Now we know that leprechauns come to school on St Patrick’s Day. Isn’t hat why kids build their leprechaun traps? 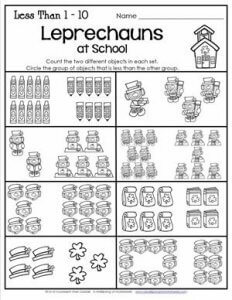 Well, here’s a few examples of leprechauns busy at school. Some even brought their lunches, books, and laptops even. Kids count how many in each set and circle the group of objects that is less than the other group.